Using an iPad in the kitchen is a great way to keep recipes close at hand, but touching the capacitive screen with your ingredient-covered fingers is a scary prospect. 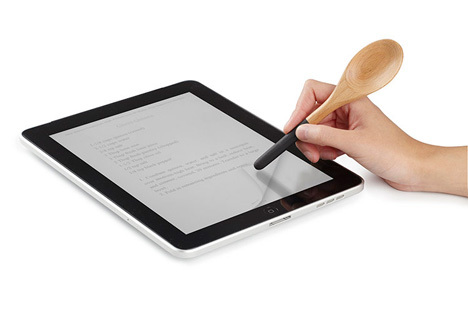 The iSpoon is a clever iPad stylus that basically puts a capacitive tip on the end of a small wooden spoon. You probably wouldn’t want to use the spoon for stirring and then for operating your iPad for fear of dripping onto the screen, but the spoon side can definitely be used as a spoon. 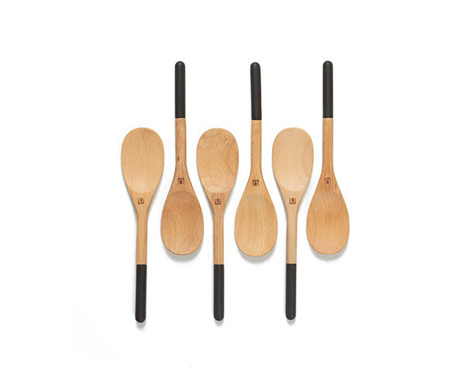 Grabbing the wooden spoon, even with filthy fingers, keeps your iPad clean and still lets you scroll through ingredient lists and instructions. Designed by Jordan Murphy for Umbra, the fun little stylus will only set you back $7. See more in Various Gizmos or under Gadgets. July, 2013.